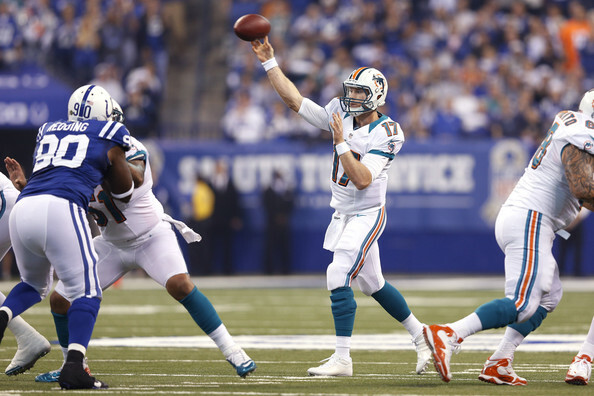 Will Ryan Tannehill outduel Andrew Luck on Sunday in Indianapolis? The Miami Dolphins will travel to Indianapolis on Sunday afternoon to take on Andrew Luck and the Colts. Colts quarterback Andrew Luck torched the Dolphins’ secondary last season to the tune of 433 passing yards and a rookie record. There’s reason to believe Luck’s matchup vs. the Dolphins’ pass defense won’t be as lopsided this time around. In fact, there’s a chance it could even swing in Miami’s favor. Of course, that certainly won’t be easy. And containing this Colts aerial assault will prove much, much more difficult than halting Brandon Weeden’s efforts at connecting with a pedestrian group of receivers in Week 1. But this Dolphins defense appears to be considerably improved from the unit that took the field last November at Lucas Oil Stadium. Last week in Cleveland, Miami’s pass rush was relentless, sacking Weeden six times and hitting him another 16. Similar success could be in store in Indianapolis. The Colts struggled to protect Luck at times against the Raiders, conceding four sacks to an Oakland pass rush that wasn’t expected to be a force this season. The Dolphins’ front seven could feast on the Colts’ offensive line, which employs two less-than-stellar tackles in Anthony Castonzo on the left side and Gosder Cherilus on the right. Cameron Wake should have another dominant game against Cherilus, whereas Olivier Vernon and Dion Jordan could expose Castonzo on Luck’s blind side. When the Dolphins aren’t able to generate pressure from the edge, expect their interior defensive linemen to penetrate the pocket and for defensive coordinator Kevin Coyle to be aggressive with his linebackers once again. Pressure almost seems imminent. But weren’t not talking about Brandon Weeden this week. We’re talking about Andrew Luck, who excels against the blitz and has the athleticism to escape pressure. Luck was 10-for-11 with a 134.8 quarterback rating when blitzed in Week 1. So, if the Dolphins are going to crash the line of scrimmage again, they better get to Luck quickly. They better have solid coverage in the secondary as well, or Luck could connect with the likes of Reggie Wayne, Darrius Heyward-Bey and T.Y. Hilton for some big plays downfield. The Dolphins’ cornerback play was very impressive in the opener, led by lockdown coverage from Brent Grimes, two interceptions from Dimitri Patterson and another pick from Nolan Carroll. But Patterson left Sunday’s game with a groin injury and didn’t practice with his teammates on Tuesday. If he’s unable to go, Carroll could be in for a long day against Luck and his big-play targets. The Dolphins’ tight-end coverage was leaky in the opener, as Jordan Cameron caught nine passes for 108 yards and a touchdown. Colts tight ends Coby Fleener and Dwayne Allen have the potential for similar production. Miami’s linebackers and safeties must do a better job containing the two. The Colts have had their share of difficulties stopping the run in recent years and finished better than only three teams doing so last season. Week 1 proved to be more of the same statistically, as Raiders quarterback Terrelle Pryor ran for 112 yards. But Indianapolis was actually pretty stout in their defense of running back Darren McFadden, who only managed 48 yards on 17 carries. And their Week 2 matchup vs. the Dolphins’ rushing attack could yield more improvement. Lamar Miller ran for only three yards on 10 carries and Daniel Thomas lead the team in rushing with 14 yards on eight attempts, as Miami’s offensive line was pushed around by the Browns’ front seven in Week 1. There’s no excuse for such a pitiful effort, but some of the Dolphins’ ineptness running the ball can be attributed to the Browns refusing to deviate from their base 4-3 defense. Even when the Dolphins lined up with three or more receivers, the Browns stayed put in their base, which is much harder to run on than nickel or dime packages. It’s unlikely that the Colts will sell out as much to stop the run. Switching up the game plan some should be in order for Mike Sherman’s offense, though. Given the Colts’ inability to handle Terrelle Pryor on Sunday, the Dolphins should consider unleashing some read-option looks. They did so with success down the stretch of the 2012 season, as quarterback Ryan Tannehill possesses the speed to challenge the edge. The Colts struggled to set the edge against Oakland, and allowing Tannehill to take advantage of that while also freezing Indy’s linebackers and linemen momentarily, could foster more of a balanced offensive attack on Sunday. Browns running back Trent Richardson was projected to have a big week vs. the Dolphins’ front seven. And initially, it looked as if that would be the case. But the Dolphins tightened the screws after the game’s first drive and held Richardson to a mere 47 yards. Miami’s dominant three-man rotation at defensive tackle, consisting of Paul Soliai, Jared Odrick and Randy Starks, was just too much for Cleveland. And I expect that to be the case most weeks against most teams. Olivier Vernon also did a solid job of setting the edge matched up with one of the league’s best left tackles in Joe Thomas. The Dolphins should have arguably held Cleveland’s ground game to less yardage, however. There were a few missed tackles on Richardson, most notably from Dannell Ellerbe attempting to go high on the near 230-pound back on a couple of plays. That will need to be cleaned up in a hurry. But I’m expecting another brick-wall performance from the Dolphins’ run defense. Running back Vick Ballard averaged 4.8 yards per carry against the Raiders last week, but Miami will prove to be a completely different animal up front and should contain, if not completely shut down Ballard, Ahmad Bradshaw and even Andrew Luck looking to move the ball with his legs, throughout the game. The Colts may own an underrated secondary with former Dolphin Vontae Davis at one cornerback spot and a pretty solid duo at safety in LaRon Landry and Antoine Bethea. But their pass rush is unproven after Dwight Freeney’s departure, and probably doesn’t have the ability to expose Miami’s offensive line like other defenses will. Ryan Tannehill should have time to make plays downfield, maybe even connect on a deep ball to Mike Wallace, who was held to only one catch for 15 yards in Week 1. Another big game from wide receiver Brian Hartline could be in store if the Colts choose to leave his coverage on an island like the Browns did. A familiar face in Vontae Davis should assigned with the task of locking up Hartline for the majority of the game. 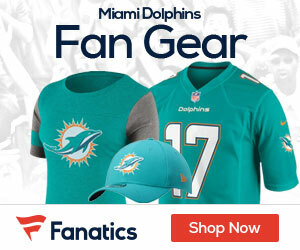 The Dolphins could also use another productive day from slot receiver Brandon Gibson and tight end Charles Clay over the middle of the field, an area where Tannehill is becoming more comfortable throwing to in his second season. But getting Wallace involved in the offense should be made a priority this week. It shouldn’t be forced, as the Dolphins must take what the defense gives them to remain as efficient as possible. But completing a couple quick, easy throws to Wallace, via a quick-hitting slant or bubble screen, would be a nice way to get a receiver with big-play ability the football. Because doing so as much as possible should be the goal. It was a great opening day for the Dolphins’ special teams, which benefited from a 3-for-3 performance from rookie kicker Caleb Sturgis and a 53.8-yard average from punter Brandon Fields. It could have been a much better or worse afternoon based on the outcome of two punt returns, though. Marcus Thigpen had a punt-return touchdown called back by a holding penalty and muffed a punt that rolled out of bounds. The first was a missed opportunity. The second was a nearly costly blunder. For the Colts, Adam Vinatieri is one of the most clutch kickers in NFL history and Pat McAfee might be the best punter in football. Also, T.Y. Hilton has the speed to change the game as a punt returner. Expect a clash of two of the league’s better special-teams units. Dolphins will impress football fans this week as Indianapolis returns to their rightful place. Miami will shake them up defensively and put pressure on both the O line and Luck. If Oakland can do it, why can’t we?